Use the Cleanreminders switch. This works most of the time. When cleanreminders doesn't work, look for the appointment the reminder belongs to and delete it. When you can't find the appointment, you need to use MFCMAPI to browse "inside" the message store and delete the reminders. Outlook will then rebuild the list with just the valid reminders. Make sure you have a space between Outlook and the slash. Using 'outlook.exe' is optional - just the program name should work. Sometimes the cleanreminders switch doesn't help. When this happens, look for the appointment that is associated with the reminder and delete it. If you can't find it, you'll need to use MFCMAPI to delete the reminder. Right click "Reminders" and select "Open Contents Table"
Find the corrupt reminder(s) then right click and select "Delete Message". Do not select all reminders, as that will delete all appointments. 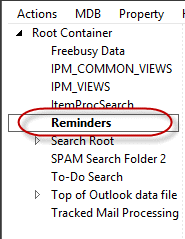 New Window Launches with title "Reminders"
Remember: Delete only the corrupt reminder(s) when you delete from inside the reminder folder you are deleting the appointment too. If you can't find the corrupt reminder, you can delete the entire Reminders folder. Outlook will rebuild the folder and the (good) reminders. Receive Reminders from Shared Calendars? Thank you! MFCMAPI 64-bit failed to work with Outlook 2007 on my Win7 64 Ultimate machine, but once it occurred to me to try the 32-bit version with my old Outlook (used only for Contacts and Calendar with my BlackBerry), it worked like a champ to delete the messed-up Reminder entry. So happy that's finally fixed! Yeah... that is a common mistake. You need to use the MFCMAPI version that matches your Outlook bitness, not Windows. Thank you! I just had a hard drive failure and upgraded from Outlook 2007 to outlook 2016 in Office 365. Even my computer guy didn't know how to fix this! I had to run the cleanreminders window a couple of times and then open and delete the old reminders and their recurrence and your instructions worked! Yay! How does this work on a Mac with Mac version of Outlook having same issue? I had this problem on Mac and when the reminder pops up, use the top of screen menu to open the related item. Then you can remove it. Good luck! Thank you! Thank you! It was SO ANNOYING!!! Thanks the clean reminders switch worked! I have followed this procedure for Exchange, but there are 10 messages that i cannot delete, nor can i delete the folder. This is the error message i received. OMG Thanks!!! It was driving me crazy. I also have this issue. Any suggestions?